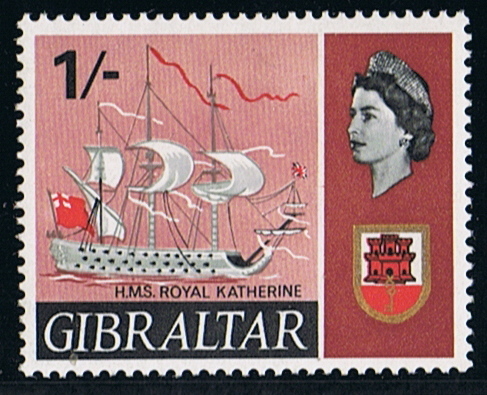 The ROYAL KATHERINE on the stamp of Gibraltar is designed after a painting made by Humphrey Vale The painting is most probably made in commission for John Sheffield, Earl of Mulgrave who commanded the ship in 1672. She was built in the Woolwich Dry-dock by the master shipwright Christopher Pett, as a second rate ship-of-the-line. May 1662 keel laid down. 26 October 1664 launched as the ROYAL KATHERINE. (some sources give KATHERINE and renamed in 1696 in ROYAL KATHERINE), she was named after Catherine of Braganza, the Portuguese born queen of King Charles II. Tonnage 1,037 ton (bm), dim. 153.1 x 39.8 x 17.3ft, draught 20 ft.
Armament: nominal 76 guns but during her career she carried a various no of guns. Before commissioned she was found unstable and needed girdling increasing her beam to 41 ft.
13 March 1665 commissioned under Captain Thomas Tiddiman. 13 June 1665 took part in the Second Anglo-Dutch War under Rear Admiral Tiddiman in the Battle of Lowestoft. From 11 June till 14 June in the Four Day’s Battle under Vice Admiral Tiddiman, where she lost 13 men and got 39 men wounded. 04 August 1666 she was in the van division during the Battle at St James’s Day. When the Dutch fleet under Admiral Michiel de Ruyter made a raid on the Medway on 12 June 1667, she was scuttled to avoid capture. 26 March 1668 under command of Captain Sir Jeremy Smith. 30 January 1672 under command of Captain Sir John Chicheley she took part in the Third Anglo-Dutch War in the Battle of Solebay. 28 May 1672 captured by the Dutch and the officers removed as POW’s, she was retaken the same day by the British. 16 October 1672 under command of Captain John Sheffield, Earl of Mulgrave for a short period, he was already relieved of his command on 12 February 1673 by Captain George Legge. 07 June and 14 June 1673 took part in the Battles of Schooneveld. 21 August 1673 at the Battle of Texel. 01 April 1678 under command of Captain Thomas Willshaw in the English Channel Squadron. In 1690 under Captain Matthew Aylmer in the Battle of Beachy Head on 10 July 1690. 1691 She was under command of Captain Wolfran Cornwall and took part in the Battle of Barfleur from 29 May till 04 June 1692. Later in 1692 under command of Captain James Gother in Berkeley’s Squadron. 1697 Under command of Captain Peter Pickard and stationed in Portsmouth. She was then taken out of service and rebuilt in the Portsmouth Dry-dock by the Master shipwright Elias Waffe. After rebuilt she got a tonnage of 1,395 ton (bm), dim. 160 x 44.6 x 18.6ft. 23 February 1703 again launched. August 1703 the ROYAL KATHERINE was again commissioned under command of Captain Henry Haughton as a 90 gun second rate ship-of-the-line. He was in 1704 relieved by Captain James Wishart. 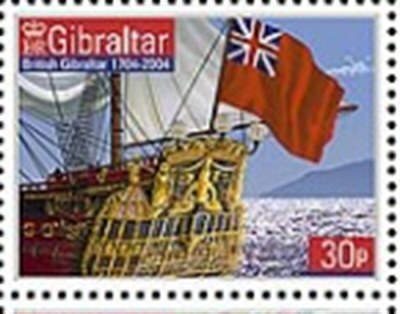 After the capture of Gibraltar by an Anglo-Dutch fleet on 21 July 1704, Admiral Rooke received information that a large French fleet was nearing Gibraltar where after he sailed out on board the ROYAL KATHARINE. 24 August 1704 she took part in the Battle of Vélez-Málaga losing 27 men and wounded 94 in this battle. 1706 Under command of Captain Archibald Hamilton and ordered home. After arrival in May 1706 decommissioned and placed in ordinary at Portsmouth. 18 December 1706 renamed in RAMILLIES. 18 December 1706 ordered to be recommissioned but seemingly this never happened. 1737 Admiralty ordered her to be broken up for rebuilt. Normally this is the end of a ship, but most sources give her history also after her rebuilding. 30 November 1742 the order was received to rebuilt her. 22 February 1743 keel laid down. 08 February 1749 launched as the RAMILLIES. Tonnage 1,685 ton (bm), dim. 168 x 48.1 x 20.2ft. Armament: Lower deck 26 – 32pdrs., middle deck 26 – 18 pdrs., upper deck 26 – 12 pdrs, quarter deck 10 – 6 pdrs. and fore castle 2 – 6 pdrs. Flagship of Rear Admiral Francis Holbourne. May 1755 under command of Captain Philip Durell, stationed in the Downs, flagship of Vice Admiral Thomas Smith. 1756 Under command of Captain Arthur Gardiner and flagship of Vice Admiral John Byng. 06 April 1756 she sailed for the Mediterranean. 20 May 1756 took part in the Battle of Minorca. August 1757 under command of Captain James Hobbs as flagship of Admiral Edward Hawke. Took part in the ineffective expedition to the Basque Roads in September 1757. November 1758 flagship of Rear Admiral Charles Saunders. 06 February 1760 under command of Captain Wittewronge Tayler (at that time she was not a flagship) she set sail from Plymouth with other ships of the Royal Navy to join Admiral Boscowan’s Channel Fleet. On the 14th a severe south-westerly gale had sprung up. The RAMILLIES had to hove to due to a bad leaking hull, and lost contact with the fleet. She was drifting eastward and Bolt Tail was sighted. The sailing master thinking that he was back off Plymouth mistook Bolt Tail for Rame Head, and he did give the advice to alter course for the shelter of Plymouth Sound. The RAMILLIES instead was now heading to Bigbury Bay, and when he found out his mistake it was too late. The order to alter course was given but by the huge press of canvas the mainmast crashed on deck, followed by the mizzen mast. An anchor was dropt and it did look the vessel was riding easier the high seas. The wreckage of the fallen rigging and mast were removed and thrown over the side. An other anchor was dropt but it was not noticed that the anchor cables got tangled and were continually chaffing till one broke and the other was not strong enough to keep the vessel from drifting to the beach. Then a sheet anchor was dropped but it was too late and the vessel drifted past Bolt Tail and with her stern first smashed into a large cave at the bottom of the cliffs. Crew on board were smashed to pulp on the rocks, when washed overboard or by trying to swim to the shore, or were drowned. The RAMILLIES started to break up in the heavy seas and breakers, the last person to leave the stricken vessel was William Wise, and he described later the wreck as, drove into such small pieces that it appears like piles of firewood. In that night more as 700 people on board the vessel died under which Taylor. The next morning the coast around Hope Cove was full of wreckage and the floating corpses kept coming ashore on each successive tide. There was a lot of looting and to this day some old houses there have something from the RAMILLIES in them. Ramillies Cove is marked on many maps, but that is not the cove she stranded, she stranded in the next cove to the east. Divers nowadays dive on the wreck and till today there is something to see of the old wreck. Gibraltar 1967 1s sg209, scott195. Gibraltar 2004 30p sg?, scott? Source: Various web-sites and British Warships in the Age of Sail 1603-1714 and 1714-1792 both books by Rif Winfield.